Nepal is the birthplace of the Buddha. There are over 12 hundred ancient Buddhist Temples in Nepal, some of the temples are more than two thousand years old. 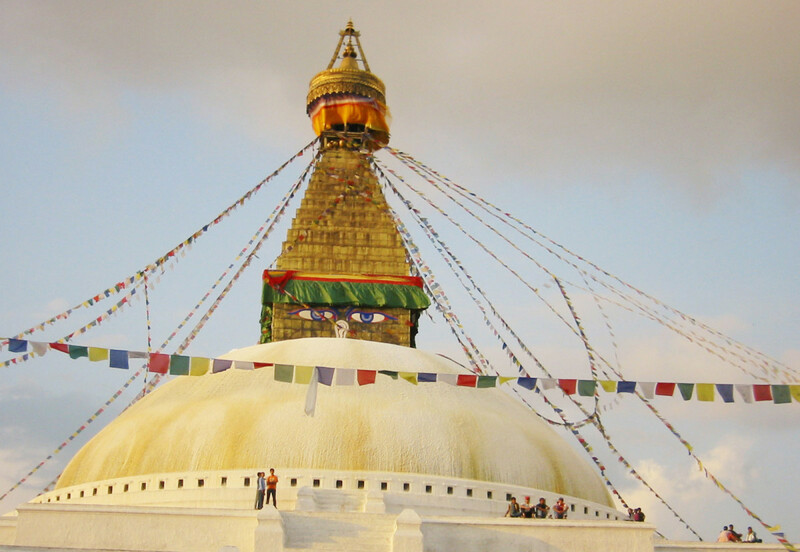 Most of the Buddhist Temples in Nepal are built in Stupa design. Stupa design consists of white washed dome, and a gilded spire with the eyes of the Buddha painted on base and brass canopy on the top. Prayer flags are hung over the Stupa and prayer wheels are fixed on the walls of the dome. 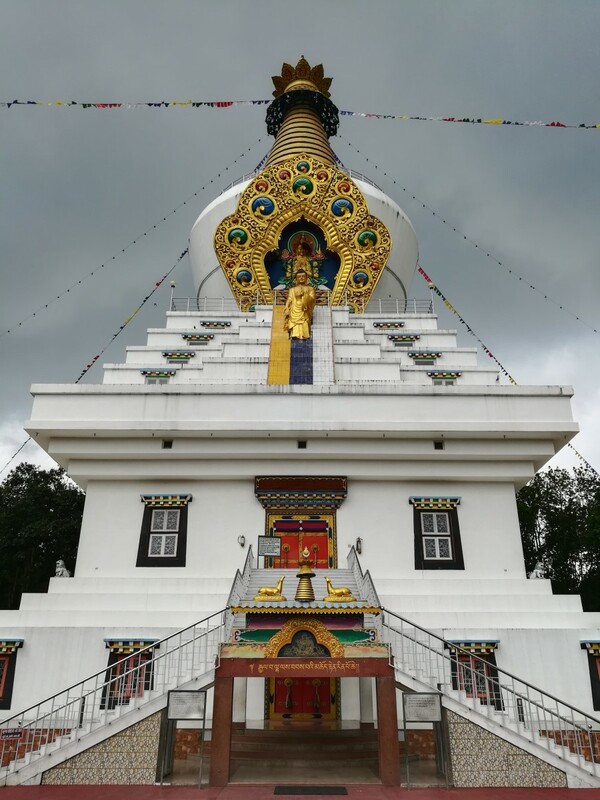 Stupa symbolizes mother’s womb, the seat of creation. Though pagoda design is very popular with Hindu Temples in Nepal, some of the Buddhist Temples are also built in Pagoda style. Pagoda style temples have with multi-tiered roofs, latticed windows, carved doors and eaves, and are built over the tiered plinth. Buddhist Temples in Nepal are also built in Spire design, popularly called Shikhar design in Nepal. Buddhist Temples in spire design consist of one or multiple spires. The spires are either the main temple or the wings of the temple. For a detailed travel guide to Kathmandu valley see Places to See in Kathmandu. The Little Buddha (1993) is a British and French production. The movie was filmed entirely in Bhaktapur and Patan city. The Little Buddha depicts the life of young Siddhartha before he became the Buddha. Most of the ancient Hindu and Buddhist temples in Nepal are located in Kathmandu valley. Kathmandu, the capital city of Nepal, is in Kathmandu valley. Since ancient time, Kathmandu valley has become a centre for Hindu and Buddhist studies and worshiping. There are three major cities in Kathmandu Valley. Swayambhunath Stupa, Boudhanath Stupa and Charumati Vihara are the main Buddhist temples in Kathmandu. These Buddhist temples with Stupa design are believed to be about two thousand years old. Swayambhunath and Boudhanath are UNSECO World Heritage Sites, and Charumati Vihara is named after the daughter of King Ashoka of India. Patan is the oldest city in Kathmandu Valley. Around 249 BCE, Indian King Ashoka visited Kathmandu valley with his daughter Charumati. Charumati and Ashkoa built five Buddhist Temples in Kathmandu Valley, of which four are in Patan and one is in Kathmandu. At least 18 ancient Buddhist temples are located in Patan. 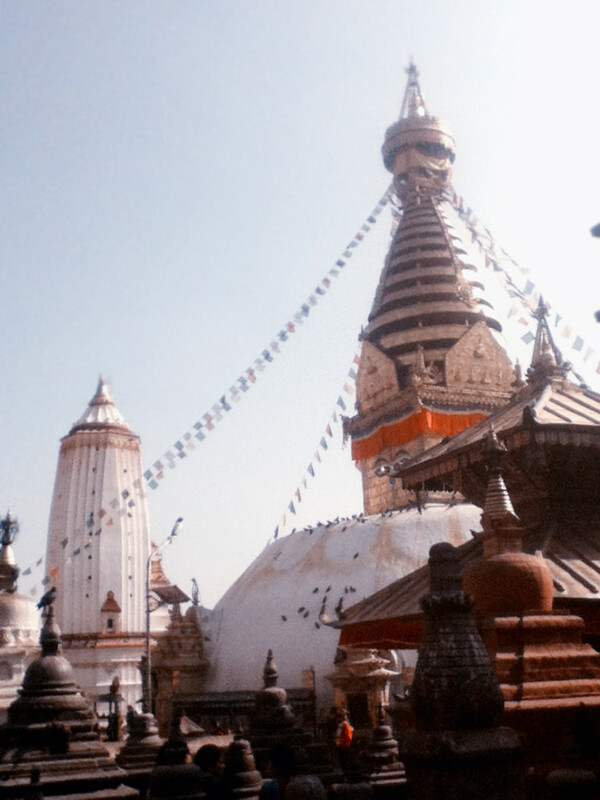 Some of the major Buddhist Temples in Patan are: The Golden Temple, Ashoka Stupas, Mahaboudha, Rato Machhendranath etc. 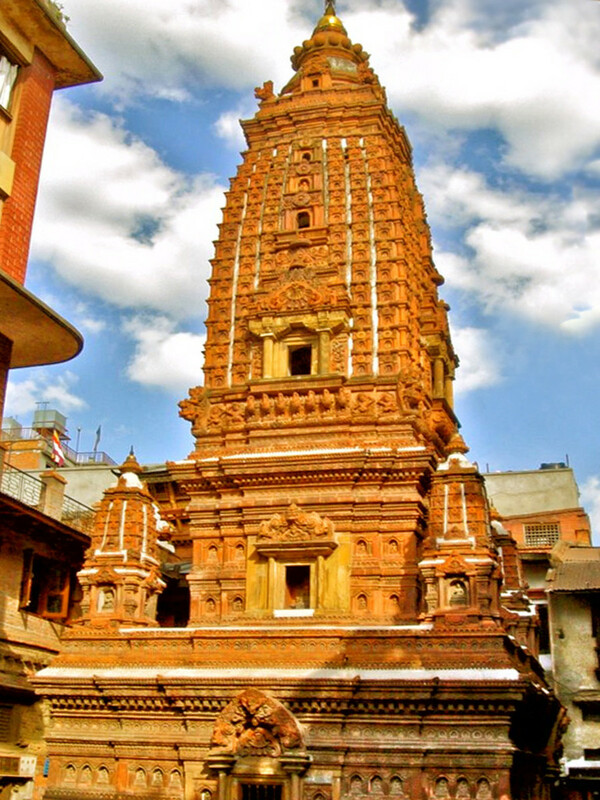 There are numerous Hindu and Buddhist Temples in Bhaktapur. Most of the Hindu and Buddhist Temples in Bhaktapur were built in 14th through 18th century. The city of Bhaktapur is still preserved in its medieval structure. The Buddha was born in Lumbini. 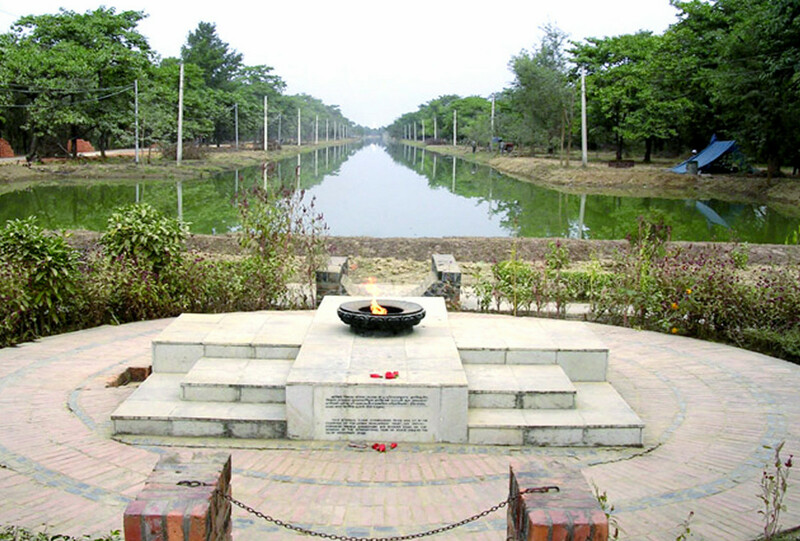 Lumbini is 26 km east from Nepal-India boarder at Sunauli and about 300 km west of Kathmandu. 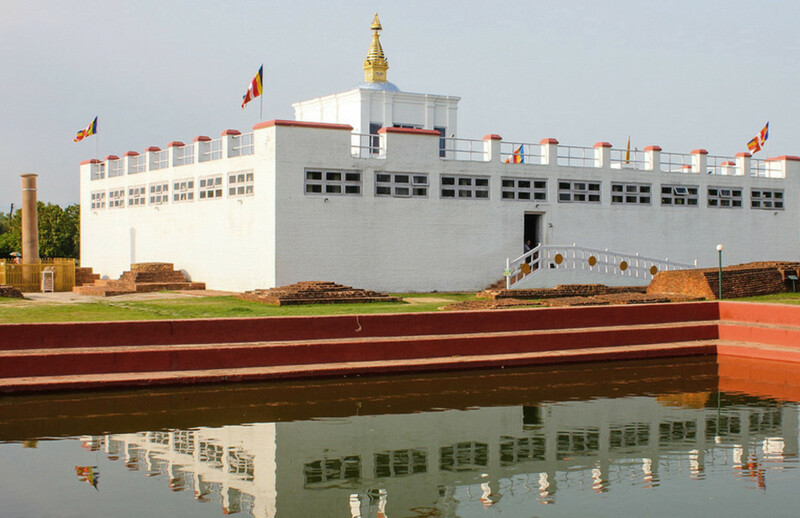 The exact spot where the Buddha was born is protected inside Maya Devi Temple in Lumbini. The current Maya Devi Temple, which was opened for the public in 2003, houses the ancient Maya Devi Temple built in the 3rd century BCE. 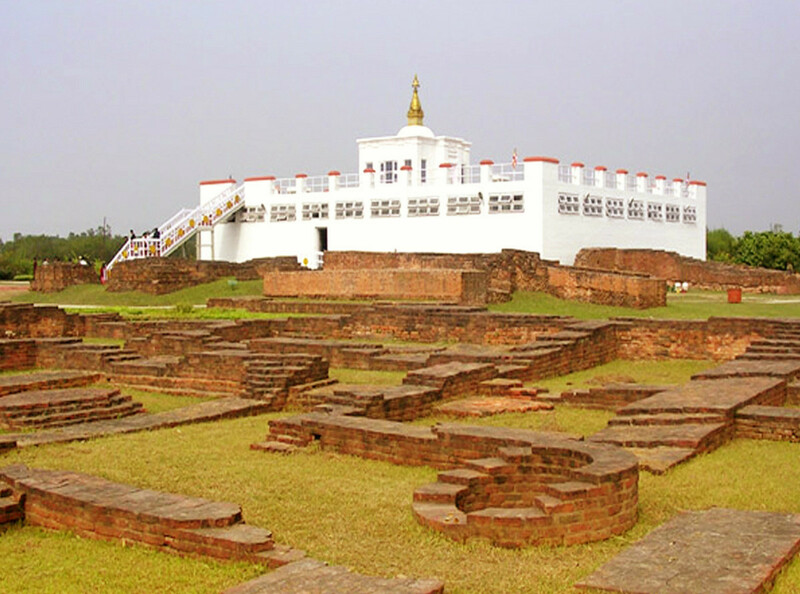 In the recent excavations, it has been found that human settlement in Lumbini the Birthplace of the Buddha goes back to 1300 BCE. 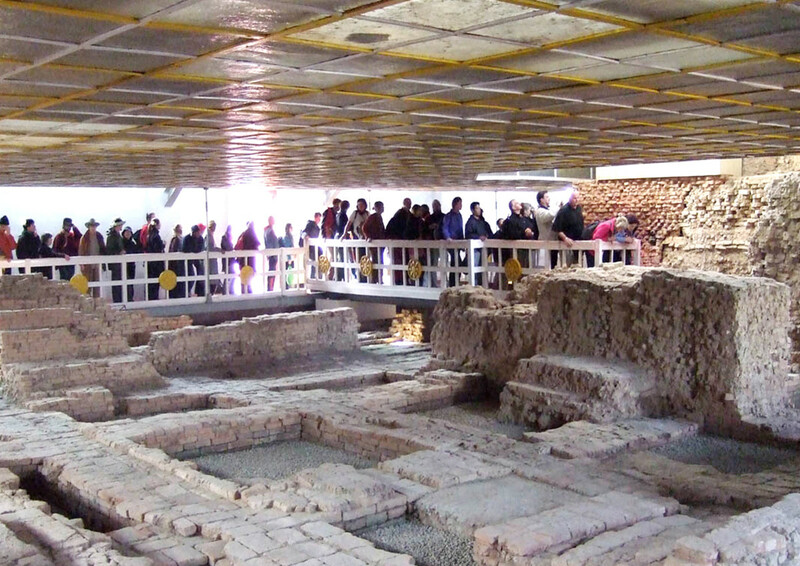 The result of three years excavations jointly carried by the UNESCO and the Government of Japan unearthed pre-Buddhist structures near Maya Devi Temple in Lumbini. The earliest record of the historical Buddha is the stone pillar erected by King Ashoka in 249 BCE. However, the new excavations have unearthed temples that are older than Ashokan Pillar. Boudhanath is the largest Buddhist Temple in Nepal and one of the largest Stupas in the world. It is located at Boudha, in Kathmandu. Boudha got its name from Bouddhanath, which is also popularly called Boudha. Boudhanath is one of the many UNESCO World Heritage Sites in Kathmandu. Boudhanath is said to be at least two thousand years old; however, most of the historians believe that the current Stupa was constructed in the 7th century. Boudhanath, one of the most sacred Buddhist Temples in Nepal, is a huge monument of dome structure and a gilded spire with the Buddha’s eyes painted on the base and a brass canopy on the top. 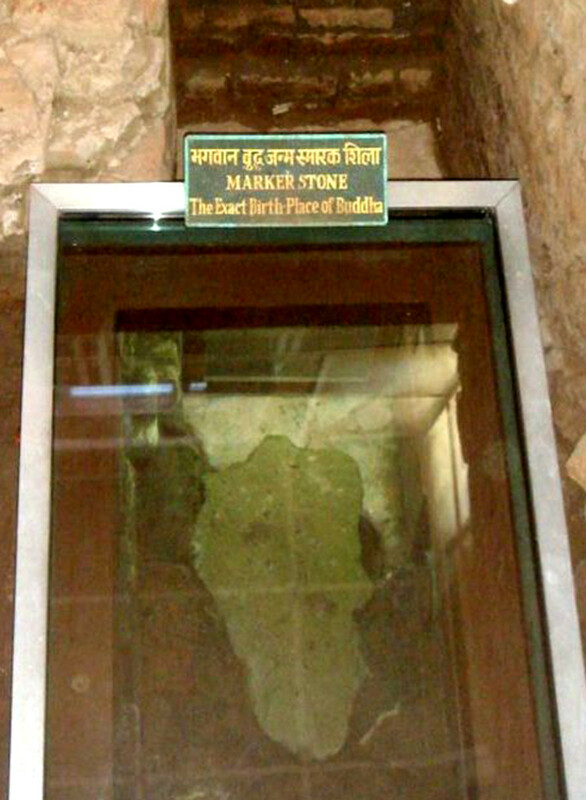 It is believed, the relics of Kashyap Buddha, one of the mythical Buddhas, is enshrined in Bouddhanath. After Tibetans were evicted from their homeland, many of the Dalai Lama followers came to live in and around Boudhanath. Today the surrounding area in Boudhanath has become a center of Tibetan religion and culture. Boudha is Nepal’s and the world’s largest Tibetan settlements outside Tibet. Swayambhunath is a giant Stupa on a hillock in the western part of Kathmandu city. It is the oldest Stupa temple in Nepal. The literal meaning of Swayambhunath is the “self-created one”. The exact date of the origin of this Buddhist Temple is unknown, however, the construction of current Stupa is credited to King Manadeva, who ruled Nepal in the 5th century. Over the years, rulers of Nepal added wings to the main Stupa. 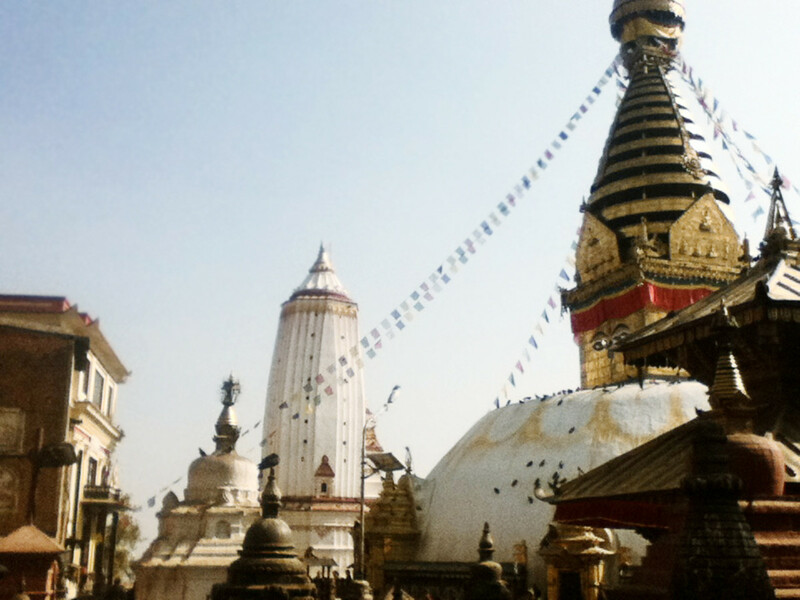 Today there are numerous shrines, temples, library, museum and a monastery in the Swayambhunath complex. 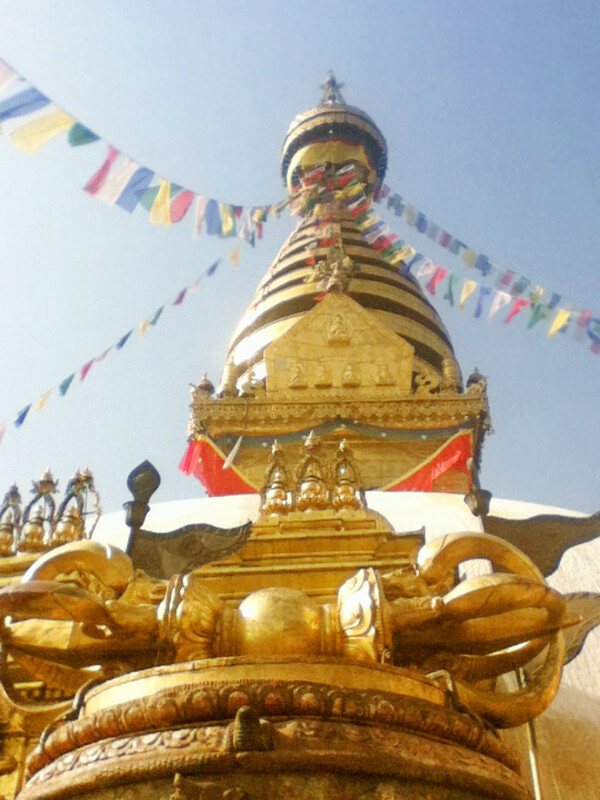 The adjacent areas in Swayambhunath are called Swayambhu, which is also used to refer Swayambhunath Stupa. There is a large brass Vajra, the thunderbolt, in front of the Stupa. Vajra is a fertility symbol in Hinduism and Buddhism. There is a 12-feet prayer wheel and three painted Buddha statues on the gate of Swayambhunath stairways and 365 stairs take you to the Swayambhunath Stupa. The spire on the Stupa was re-gilded in 2010 with 20 kilograms of gold. On the base of the Swayambhunath hillock, in the western side, there are brass statues of the Buddha, Manjushree and Padhmasambhava. 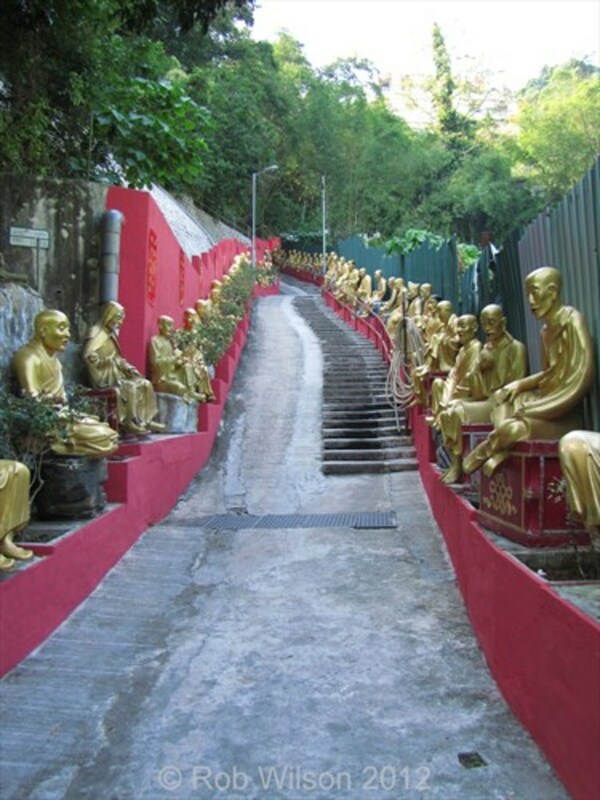 These brass statues of the Buddha and the Bodhisattvas are said to be the tallest in the world. Indian King Ashoka built five Buddhist temples in Kathmandu valley when he visited Nepal in c. 249 BCE. Charumati Vihara is one of the five Buddhist temples built by Ashoka. Charumati Vihara is named after Ashoka’s daughterr Charumati. Vihara is Sanskrit word for monastery. Similar to Swayambhunath and Boudhanath, Charumati Vihara is also a Stupa with many shrines built around. Charumati Vihara is in Chabahil, Kathmandu. Mahabaudha Temple is little away from Durbar Square Patan. The current temple was rebuilt from the rubbles of the temple dating back to 1585, when an earthquake destroyed it in 1934. Every bricks in the Mahabaudha temple has an image of the Buddha, thus the temple is also called Temples of Million Buddha (Mahaboudha). In the courtyard of Mahaboudha, there is a small shrine dedicated to Maya Devi, mother of the Buddha. Hiranya Varna Mahavihara is a Buddhist temple near Mahaboudha, which was constructed somewhere in the 12th century. The current temple dates back to 1409. The front part of the temple is covered with gilded plates, thus Hiranya Varna Mahavihara is also called the Golden Temple. 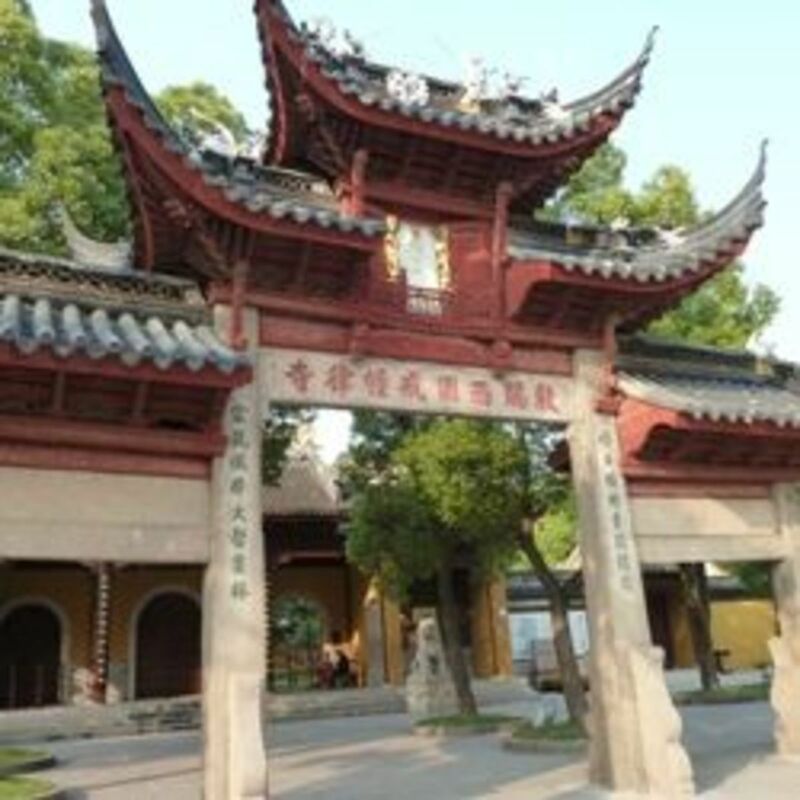 It is a multi-storied pagoda styled temple built on a tiered plinth. There are numerous shrines and idols of Buddhist deities in the Hiranya Varna Mahavihara complex. Stone lions and elephants guards the Golden Temple. You can see paintings and idols of the Buddha and Buddhist deities inside the temple. On the ceiling of the temple, there is an embossed Kalachakra Mandala. Rudra Varna Mahavihara was built in the 6th century. 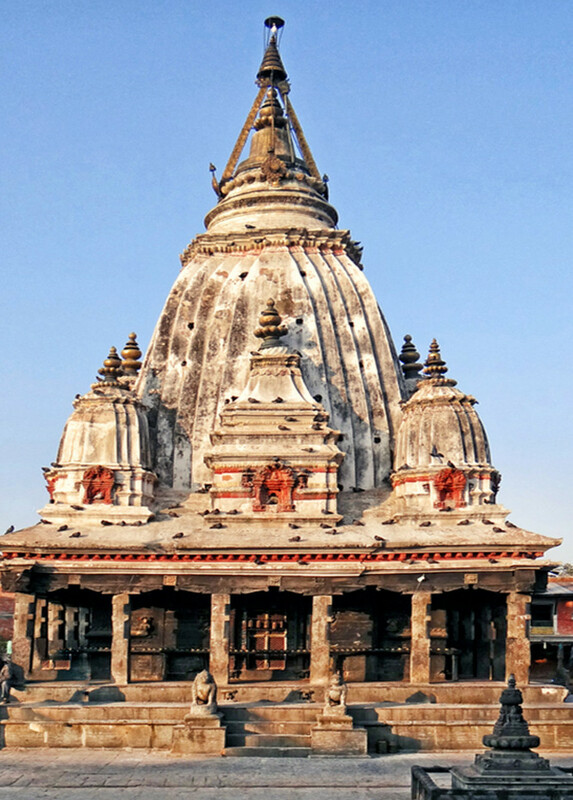 The temple is named after King Rudra Deva, who renovated the temple in 980. There are stone and metal figures of Buddhist deities inside the temple. Hindus in Nepal worship Machhendranath as a form of Hindu God Shiva, whereas Buddhist believe Machhendranath is Karunamaya, (literally, the compassionate one) one of the names of the Buddha. The main temple was built in 1673, however, some of the structures in the Machhendranath complex dates back to 1408. 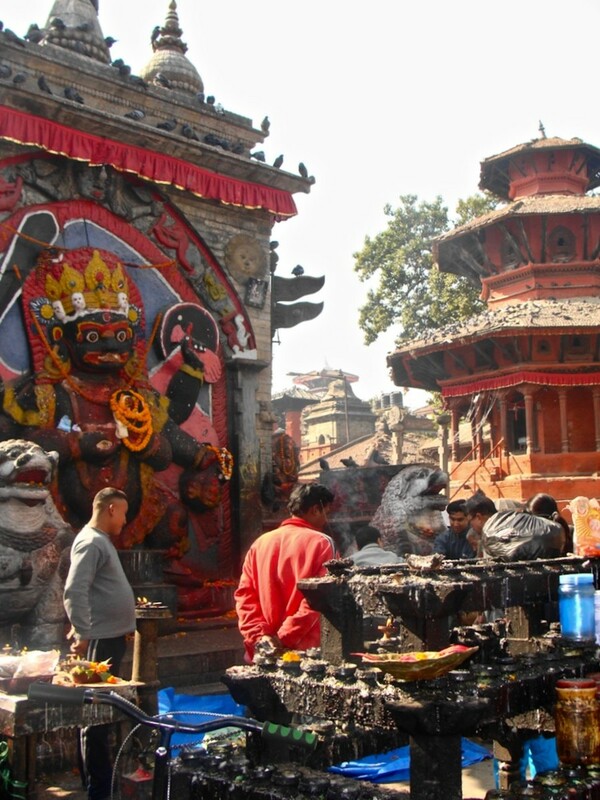 Festival of Rato Machhendranath, which falls somewhere in April or May, is one of the much loved festivals in Nepal. 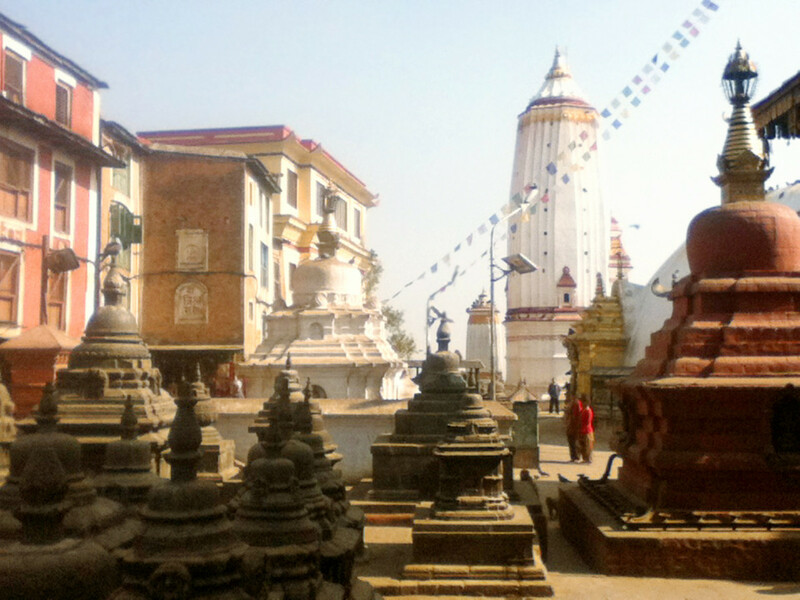 Rato (Red) Machhendranath Temple is in Patan, where as Kathmandu has a temple of Seto (White) Machhendranath. It is not known why Machhendranath has been named Red and White, but these two forms are the variations of the same deity. The temple of Seto Machhendranath is in Asan Tol, north of Kathmandu Durbar Square. 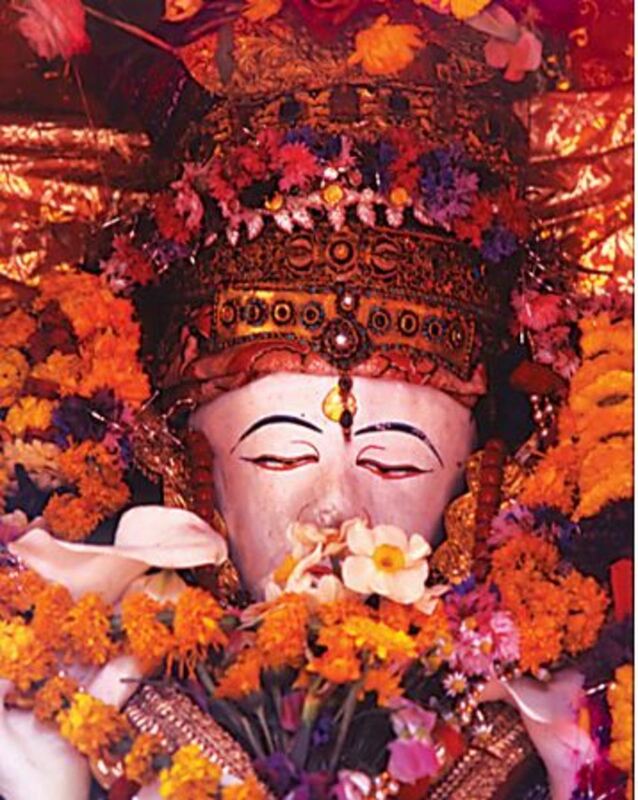 The festival of Seto Machhendranath, which falls in March or April, is celebrated with much fanfare. In the temple complex, there are small shrines of Hindu and Buddhist deities, sculptures of animals and humans. Namo Buddha is one of the three major Buddhist religious sites in Kathmandu valley; other two are Swayambhunath and Baudhnanath. According to a Buddhist legend, in one of his many incarnations, Lord Buddha fed his flesh to a hungry tigress and her clubs. For many years whenever people passed by the place, they chanted I take refuge in the Buddha (Namo Buddha). This is how the place got its name. The Namo Buddha Temple, which is in Stupa design, is on the hillock, in Banepa district, about 40 kilometers east of Kathmandu. Like every Buddhist temples in Nepal, Namo Buddha is also decorated with prayer flags and prayer wheels. There are numerous Buddhist shrines in and around Namo Buddha Stupa. Every day hundreds of people visit Noma Buddha and perform circumambulation and light butter lamps. 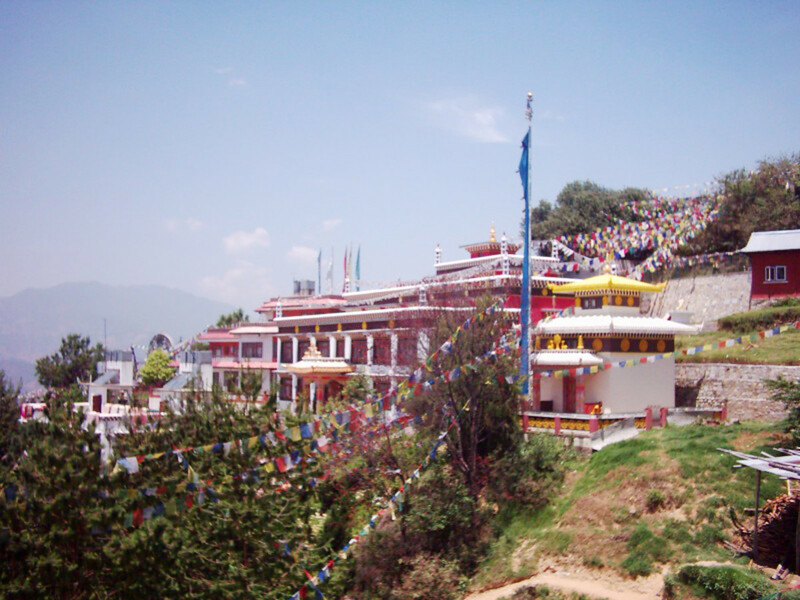 There are many monasteries in and around Namo Buddha, famous among all is Thrangu Tashi Yangtse monastery. Ka-Nying Shedrub Ling monastery is in Boudhanath, Kathmandu. The name Ka-Nying Shedrub Ling comes from the Kagyu and Nyingma schools in Tibetan Buddhism. Ka-Nying Shedrub Ling monastery tries to incorporate the teachings of these two schools. It was founded in 1972. Since 1981, the Buddhist Monastery has been teaching Tibetan language and Buddhist philosophy to the Westerners. Upon completing the program from Shedra Institute of Ka-Nying Shedrub Ling monastery, the students are awarded Bachelors Degree in Art and Masters Degree in Art from Kathmandu University. 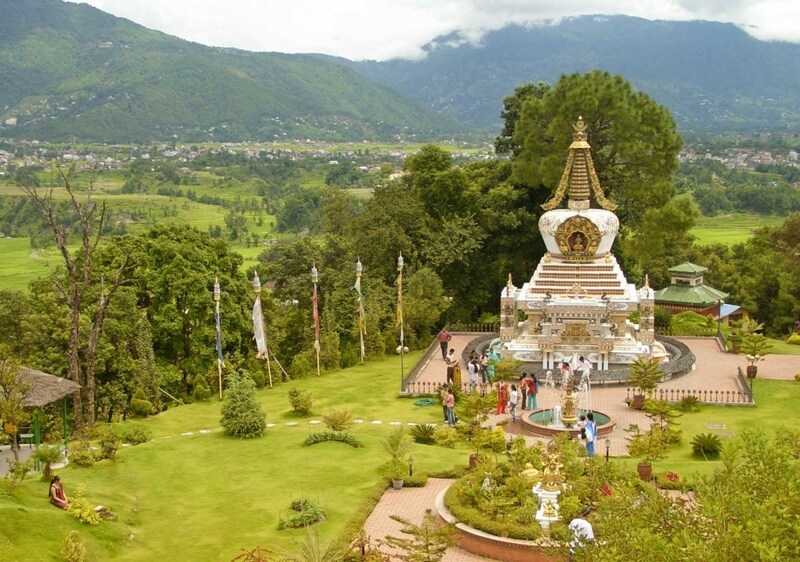 Thrangu Tashi Yangtse Monastery is in Kavrepalanchok district, in the vicinity of Namo Buddha. It was founded by the ninth Khenchen Thrangu Rinpoche in 1978. It is a center for Buddhist meditation, worshiping and studies. About 250 monks live in Thrangu Tashi Yangtse Monastery. The Monastery also runs a school for young Buddhist monks. The monastery was founded in 1916. Some of the temples and shrines in and around the monastery date backs to 1880. Tengboche Monastery is situated on the backdrop of world’s highest mountains such as Everest, Nuptse, Lhotse and Ama Dablam. The largest and the oldest monastery in Khumbu, Tengboche Monastery is also the first monastery under the Nyingmapa lineage of the Vajrayana Buddhism. There are about 60 monks living in the monastery. Sometimes also known as Dawa Choling Gompa, Tengboche Monastery is a center for Tibetan Buddhism Rituals for the Sherpa community of Nepal. About 15,000 people visit the monastery every year, and over 600 people visit Tengboche Monastery every week in peak tourist season that is during March to June. The monastery also runs Debuche Nunnery. Thrangu Tara Abbey is a Buddhist nunnery located in Swayambhunath. It was established by Thrangu Rinpoche. The nuns study and practice Buddhism in the nunnery. The major deities worshipped in the nunnery are Green Tara and Mahakala. Since 2004, the nunnery is running Tara Abbey Monastic College for Higher Buddhist Studies for women. The nuns of Tara Abbey also operate a Tibetan Medical Clinic. Sher Gonmpa is in Manang district. Manang is normally referred as the place beyond the Himalayas. Manang is in the Annapurna Mountain Range, near Nepal-Tibet boarder. According to the Buddhist legends, Milarepa (1040-123), one of the four Bodhisattvas in Kagyupa (Karmapa) School in Tibetan Buddhism, meditated in the caves around the Sher Gonmpa. Kopan Monastery lies on a hillock called Kopan, on the outskirts of Kathmandu. It is 3 miles east of Boudhanath. The Buddhist Monastery, which follows Tibetan Buddhism, was founded by an international organization that promotes and preserves Gelugpa dharma centers. Kopan Monastery is sponsored by the Foundation for the Preservation of the Mahayana Tradition. 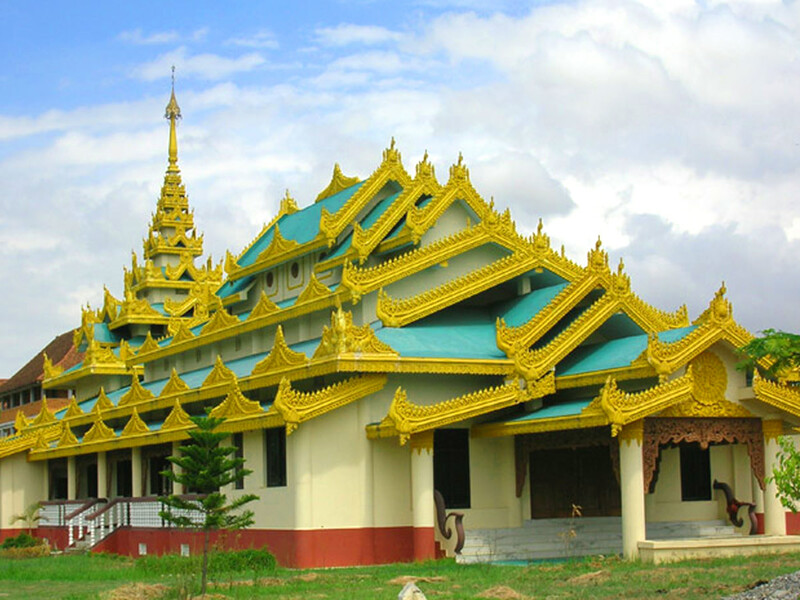 This Buddhist Monastery serves as a school of Buddhist philosophy, meditation center, and recreational hub for the locals and the foreigners. Kopan monastery also operates a nunnery that accommodates more than 400 nuns. White Monastery is one of the top places to visit in Kathmandu. It is situated on a hillock, north-west of Swayamhunath Stupa. White Monastery, which is built in Tibetan design, is a wonderful destination for mountain and sunrise/sunset views. The White Monastery is one of the most popular Buddhist Monasteries in Kathmandu for Buddhist Studies, Buddhist Meditation and leaning Tibetan language. Thrangu Tashi Choling Monastery is in the vicinity of Boudhanath Stupa, in Boudha, Kathmandu. It is one of fifty plus Tibetan Monasteries in Boudha. The monastery was founded by Thrangu Rinpoche in 1979. 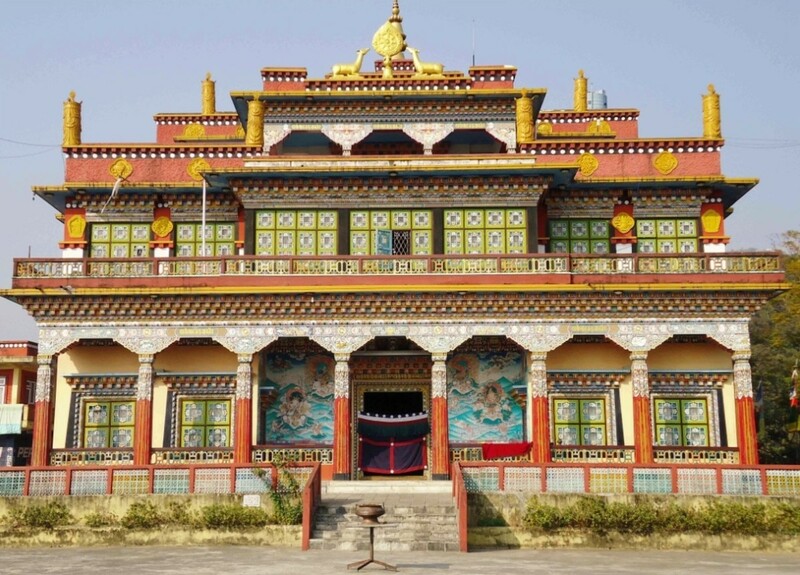 Thrangu Tashi Choling Monastery is a learning, worshiping and meditation center. 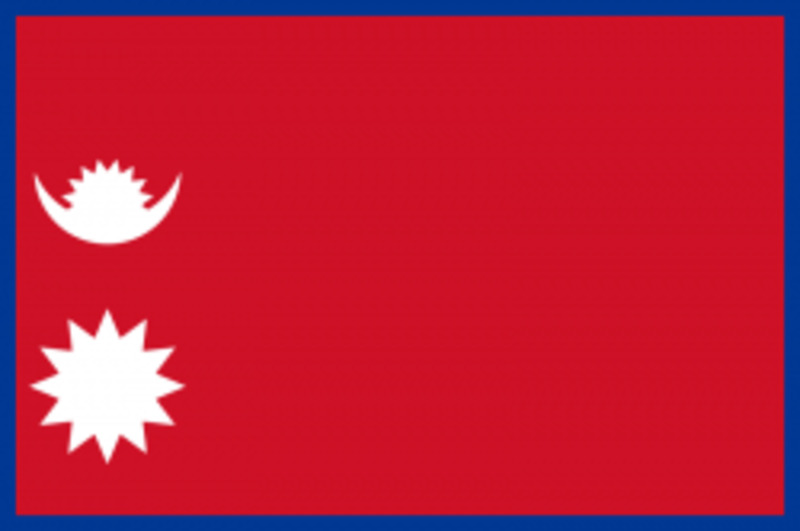 You are doing a wonderful job of showing the world that Nepal is a sacred land. Glad to see this wonderful piece out here on this topic. Photography is great as well the information on the temples/stupas. Hope all is well with you and your wife and congratulations on being a father. Muktinath Temple is another popular temple among Buddhist in Nepal. Muktinath Temple is located in Mustang District of Nepal at an altitude of 3710 meters above sea level. 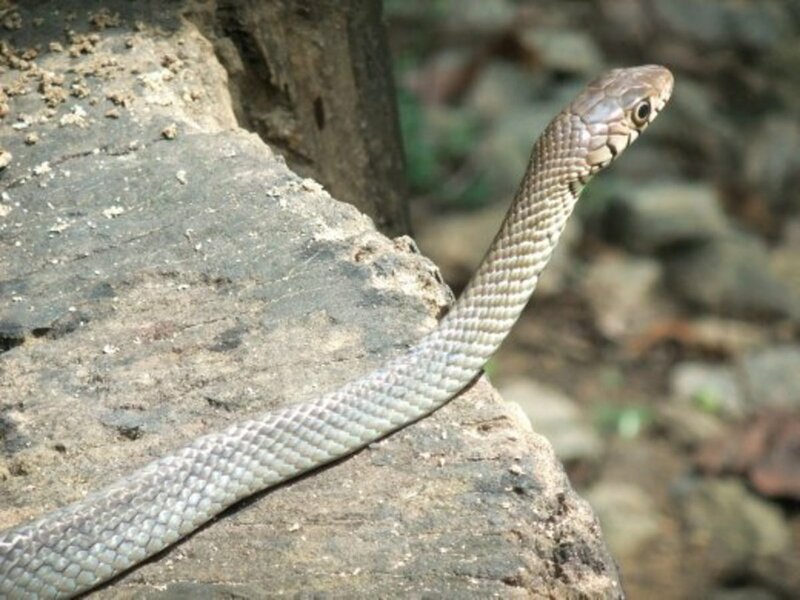 Buddhist called it Chumig Gyatsa and Hindu called it Muktidham. Helicopter will directly take you to this temple from Kathmandu and Pokhara just in one day. Whereas two days by road from Kathmandu or Pokhara. From Kathmandu, Muktinath Temple is in 406 km distance and 200 km from Pokhara. I would love to be able to see some of these beautiful temples one day. Thank you for presenting them here. Thank you very much for taking this virtual tour. I appreciate your wonderful comments. Thanks for sharing this interesting info on Buddhist temples in Nepal and the magnificent pictures. Excellent tour and a beautiful imagery, Vinaya. Thanks for sharing! Thank you my dear writers and friends for traveling with me. I'm glad that you liked this virtual tour. I appreciate your wonderful comments. Thank you for this wonderful hub here on the ancient temples. I am awestruck with the sheer beauty of their architecture, so detailed! Wow. I cannot even imagine how more beautiful they would be to actually see in person, but your photography is amazing and it feels as though we are really there, together with the fascinating history you have detailed here. Excellent work here as always! Wow, what gorgeous pictures, Vinaya, and so impressive they are. Excellent article on the topic. I did not know too much about them. This makes me more aware of how brilliant people can be when it comes to architechture! Thanks for sharing! My favorite among this collection is the one at Kopan monastery. It looks quite graceful compared to the others. Voting this Up and Beautiful. Wonderful information. Thank you for sharing. Wow Vinaya, thank you for the tour of the Temples! Very impressive! The temples are very beautiful esp. the Stupa. It would be wonderful to visit them all. It is amazing how far back in time they originated. I find this hub interesting and educational. Thank you for sharing again Vinaya. How lucky we are here to have a friend like you to show all the ancient and enchanting temples. I cannot imagine what it would be like to live near something of this magnitude. My history is less than 300 years old! So you can see what a difference. Great work on this, thank you so much, voting up and sharing. It would be so amazing to see these sites. Until that day comes I'll have to rely on you, Vinaya, to be my tour guide. Thanks you for the wonderful information and great pics.